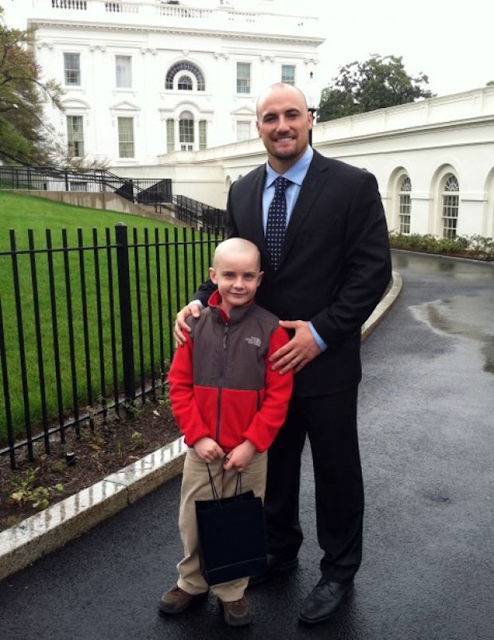 Jack Hoffman with former Nebraska football player Rex Burkhead after meeting with President Barack Obama in Washington, Monday, April 29, 2013. The 7-year-old, who is fighting brain cancer, attracted millions of fans after his 69-yard touchdown run during Nebraska's spring football game. Nebraska student-athletes Rex Burkhead and Emily Wong were honored by the Big Ten Conference on Thursday, as they were named two of 24 Outstanding Sportsmanship Award winners for the 2012-13 academic year. Burkhead and Wong were chosen from a group of over 300 student-athletes throughout the academic year who have displayed positive sportsmanship. Burkhead was a four-year performer at running back for the Husker football team and was recently drafted by the Cincinnati Bengals. As a Husker, he finished his career as one the top five all-time rushers in Nebraska school history with 3,329 yards while also rushing for 30 career touchdowns. As a senior, Burkhead rushed for 685 yards and five touchdowns in eight games, highlighted by a season-best 140 yards in the Capital One Bowl against Georgia. Off the field, he named a two-time CoSIDA First-Team Academic All-American (2012-12) and was chosen the captain of the Allstate AFCA Good Works Team in 2012. Wong is a junior gymnast for the Huskers and finished third at the 2013 NCAA Championships in both the all-around and on floor exercise. She earned four All-America certificates at the 2013 NCAAs and won four of five individual titles at the 2013 Big Ten Women’s Gymnastics Championships. A two-time Big Ten all-around champion, Wong ranks fourth in school history with eight All-America honors. In the classroom, she was a first-team Academic All-District VII member and is a candidate for CoSIDA Academic All-America honors. One member of each varsity sports team on every campus was chosen by his or her institution as a Sportsmanship Award honoree. From each university’s list, two Outstanding Sportsmanship Award winners were then selected. All of the Sportsmanship Award honorees have distinguished themselves through sportsmanship and ethical behavior. In addition, these student-athletes must be in good academic standing and must have demonstrated good citizenship outside of the sports-competition setting.